A few years ago, my dental hygienist enthusiastically told me that her children’s school was completely computer based and every kid had a laptop. With my mouth wide open I couldn’t say anything, but I wouldn’t have known how to respond even if I had been able to talk. After all, computer learning is everywhere so it must be good, right? But somehow it didn’t seem wise. Many, like my dental hygienist, are enthusiastic about it, but others, like some of the top tech creators, strictly minimize their children’s exposure to screens, even to the point of sending them to special no-tech schools. What do they know that we don’t? And what are the implications for homeschooling? We have used some computer-based curricula with my children in the past, although we never depended on it. While this worked rather well for teens in subjects such as math, foreign language, and accounting, it did not work well for most other subjects or for little people. In fact, I sadly recall times when I insisted my elementary aged children do ‘schoolwork’ on the computer while they would have been much better off doing paper and pencil work or even just playing. Because I don’t want other little ones to face the same educational disadvantages, I want to discuss the educational aspects of Dr. Kardaras’s book Glow Kids and apply his thoughts to homeschooling. On the other hand, screens do have a place in education, but not in the way they are often used. That is also discussed in Glow Kids. Well then, what about all the glowing information that comes our way about the importance of computers in education at all levels? Kardaras shows behind-the-scenes machinations, corruption, and unfounded idealism in the battle to sell educational material, including software and tablets, to schools. It’s a sad story, one all parents should be aware of. Naturally, we homeschoolers are most interested in what this all means for our own families. So, based on the research presented in Glow Kids, what can we say about screens in the homeschool? Ideally, preschool and elementary learning should be done without screens. There are excellent non-screen educational resources and curricula, and building strong relationships with people, the real world, and books is still one of the main benefits of homeschooling. Even for repetitive work such as math drill, it is best to try a low tech approach like hands-on math play, old-fashioned flash cards, or a paper-based drill program such as the excellent Calculadder. Some computer learning could be helpful for middle school if it is accompanied and supported by quality teaching. It would be best to focus on high-education value and avoid high-addiction materials. Examples of helpful tech use could include online research, Math Score (unfortunately it has also added a game), Seterra (geography facts), Rosetta Stone, and Duolingo (languages). 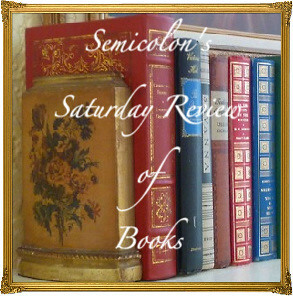 (Note: All links in this article are to my reviews.) On the other hand, having books for research, pen and paper for math and spelling drills, and a live teacher for languages would undoubtedly be better, but these things are not always possible for a homeschooling mom. For high school, effective computer learning we have used alongside more traditional learning includes ALEKS (mostly math), Professor in a Box Accounting, Rosetta Stone and Duolingo, Seterra, Windows Programming, Web Design, and The Great Courses (caution: at least one of their instructors is known for attacking Christian beliefs, so this is not a blanket endorsement). I have written about a few more helpful learning resources for high schoolers, ones that are tools, not toys. There are online learning programs that are essentially a classroom on a screen or that are actual live classes, involving interaction with a real teacher and other students. We have never tried the former, although we did benefit hugely from AP English taught online, but I know families who have used them successfully for older children and teens. These programs are not the hyper-arousing, game-based ‘educational software’ that cause problems but valid and successful ways of learning, although in-person teaching is always best, especially for younger children. There are also learning programs for disabled or special needs children that do not rely on bells and whistles but give children the ability to keep up in the classroom, and those also tend to have a net benefit. On the other hand, kids who are clinically addicted to screens would benefit from a full digital detox; even educational screen use should be completely eliminated for a period of time. For more information, see Glow Kids or consult an addictions counsellor who understands screen addiction. All that being said, we live in the real world and it is not good for kids to be completely out of step with what their friends are doing. When older children want to play games, here are “Three Computer Games that I Almost Always Allow”. Yes, they are educational but they, too, can be addicting; after what I’ve learned from Glow Kids I would raise the recommended age and also say that they should not be played before bed. Oh, the things I wish I had known earlier! I encourage you to reconsider screen use in your homeschool, eliminating it for little ones and minimizing it for all. It’s also worth reading Glow Kids: How Screen Addiction is Hijacking our Kids—and How to Break the Trance. 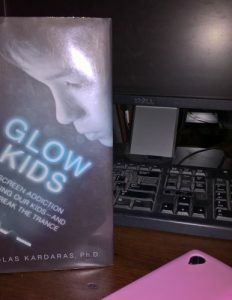 Review of Glow Kids: How Screen Addiction is Hijacking our Kids—and How to Break the Trance by Nicholas Kardaras. Screens and our Kids’ Mental Health. 52 Ways to Connect with your Smartphone Obsessed Kid by Jonathan McKee. Smart but Scattered Teens by Guare, Dawson, and Guare. Growing Up Social: Raising Relational Kids in a Screen-Driven World by Gary Chapman and Arlene Pellicane. Thanks to Miss 16 for the photo. Note: All links in this article are to my reviews. If you enjoyed this review, you might want to follow me on Google+, where I often mention helpful or interesting ideas, friend me on Facebook where I occasionally show up, or connect with me on GoodReads where I eventually share what I read. Disclosure: I borrowed this book from the library on the recommendation of a pediatric concussion specialist (statistically, phone use and kids’ susceptibility to serious concussions have increased at the same time) and have given my own honest opinions. 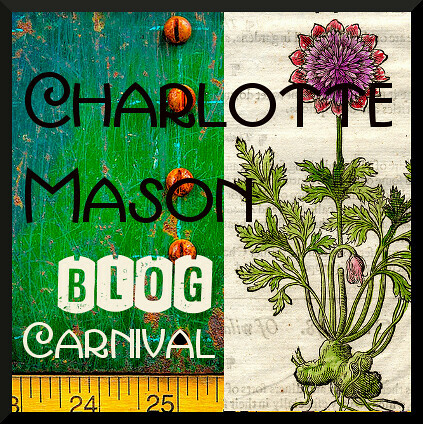 This article may be linked to Saturday Reviews, Booknificent Thursdays, 52 Books in 52 Weeks Challenge, Literacy Musings Monday, and The Book Nook as well as to Inspire Me Monday, Raising Homemakers, Friendship Friday, Make My Saturday Sweet. Posted in: Health, High School, Homeschool, Homeschool Tips, Reviews, Reviews: Nonfiction. I have used your link for “computer games I almost always allow” many times. Seterra has some wonderful new applications too, like anatomy. Screen time is such a hard issue. My personal preference would be to pull the plug on the whole thing, but God has, in His providence, allowed for this progress and has given it as a tool to this new generation and, like all things after the fall, there is sin, even in how we deal with adiaphorous things like technology. A great documentary on this is ‘Captivated’, available a the OPL. Yes, screens are a hard issue. This article only addresses the educational aspect and there are so many aspects to look at. I have two more articles written that will be published soon, and my head is teeming with more, but I have other writing projects to work on instead. Thank you for telling me about “Captivated” and about the anatomy on Seterra! Just watched Captivated. Thank you so much for recommending it! Even though it is a few years old, it is true, powerful, wise, godly, and practical. If only we could get more people to watch it–but I know how it is; it took me a long time to get around to it, too.